This early May comes the 3rd DreamHack event in 2016 that will feature the best teams in NA duking it out for bragging rights as the best NA team while competing overseas. Top NA teams like Team Liquid are still without their best player s1mple. Cloud 9 had a roster change a few weeks back adding Slemmy. Splyce will be playing without abE and Professor_Chaos but will have fREAKAZOiD (Cloud 9 backup) and summit1g (streamer) as stand-ins. It would be interesting to see if Cloud 9 could reclaim their spot as the best NA team after being behind for so long against Luminosity Gaming and now a newcomer in the ranks in Team Liquid (#2). The All-Americans (2 brazilian teams with NA based organizations) are ready to excite the crowd as the fans will be treated with their hometown heroes competing against each other on their local soil. Betting odds available for all matches. Live Streaming available for all matches. Luminosity Gaming are clearly the frontrunners in the tournament and it will be hard to argue since only NA teams were invited for the event. LG have been the #1 NA team even before their rise because Cloud 9 was in a year long slump that eventually led to roster changes. CLG and Tempo Storm could definitely put up a fight and they will be my picks to be the runner-ups or even champions incase LG miraculously fall. Cloud 9 are on a tear lately in the NA scene only losing to LG but they still have a lot to prove since their wins does not involve high level teams. I highly doubt Selfless and Splyce (especially with their stand-ins) to make it out the group stages. Tempo Storm just won CEVO Gfinity season 9 and is the only threat to LG at the moment. 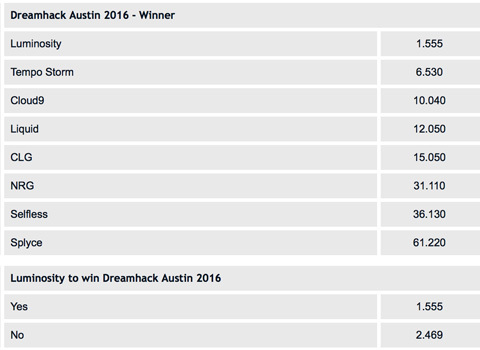 They have impressive wins against VP, dignitas and SK Gaming who are all better than the teams we see in DH Austin except for LG. My pick remains LG to take the 1st place and Tempo Storm as a close 2nd. The addition of Slemmy surprisingly made the team better than what I was expecting. They are clearly a better Cloud 9 team than before but with the rise of Tempo Storm lately I doubt they could pull it off. N0thing has come up big for Cloud9 lately and expect to see the same from him. The rest of the players has been up and down lately especially Slemmy but you can also expect him to turn things around in different ways as he is also the in game leader for C9. Tempo Storm, in my opinion, has the better map pool, current form and chemistry while C9 only has their unpredictability coming into the series making it a little risky to side with the NA team. Luminosity Gaming is still on a tear lately and it's safe to say that you can compare those wins in the past here. They have been playing against NA teams and clearly are the team to beat from the get-go. FalleN has been huge for the team and has numerous clutches to his name. They have only dropped a total of 8 rounds throughout the tournament including one against a Semifinalist in C9. I don’t remember any history of titling from the brazilian squad which makes them a comfortable pick most of the time. Team Liquid was lucky to be in the easier group and as expected finished 2nd. Putting a Cloud 9 or a CLG to the group could have definitely put a scare to their playoff hopes but instead they faced Selfless in the elimination match to climb back up. I honestly think that they have little to no chance against Luminosity. Even if nitr0 keeps going, they still lack the firepower to topple LG who is in top form right now. LG is clearly on a different level than Splyce and maybe even 3 levels higher. I am not sure if they are better without abE and Professor_Chaos because I think fREAKAZOiD could be better than them but not summit1g. Summit1g has little to no experience but has some skill and maybe he could transition into a team in the near future. With a team like LG, you will need more than just an aim/form advantage if you want to take them down. Tempo Storm had an amazing run at CEVO and eventually won the tournament against a lot of great EU teams. It was shocking to see how they were underdogs throughout even after their top finish in the groups and their impressive win against dignitas. They overcame all those odds in dramatic fashion with a lot of tight matches. On the other hand, NRG has been an up and down team in the NA scene. They get steam rolled by top teams when matched up against them but perform quite decently and split some matches against similar tier teams. I guess what I am trying to say is that they don’t have that upset potential. They almost beat Team Liquid for the final spot in ESL Pro League and defeated EnVyUs in Counterpit with an enormous odds disadvantage. They can be a good NA team but it is still a long stretch to put them along with the top where Tempo Storm is currently at. Cloud 9 had a new recruit back in late April which makes them a tough choice chemistry-wise since Slemmy, the new recruit, is also the in-game leader for them. They have performed well recently with only one significant loss against LG and a great finish to the ESL Pro League Season. They haven’t been competing in top events lately which is another risk if you are riding the Cloud9 hype train. Overall they still have their core pieces and did not lose that much even adding a new trial coach a few weeks back. CLG is more of a streaky team. Sometimes tarik or others play out of their minds and basically win the match for the team and sometimes just perform really bad as a unit. With the history between these two, it is really more of a 50-50 games to say the least. They play against or with each other on stream and know each other pretty well. With s1mple out and adreN back in, Team Liquid look like a worse team. Maybe because s1mple was just carrying most of the load before going back home and leaving the team. They still have young players with potential like EliGE to look forward to. They are still a great NA team without s1mple. They had some top 4 finishes without him before and that was against teams like Na’Vi and VP. Selfless is also an up and down team like most of the NA teams out there. That is why they call it NA CS where anyone can win no matter the odds. They have a last place finish in CEVO but only because of the tough group they were in. Nonetheless, they got cleaned out literally. They won a total of 15 rounds in 4 maps which is absurd. They lost 16-3 and 16-1 to SK Gaming in an elimination match. We could probably see from there that Liquid are the better team. I don’t see them losing that badly even against a good SK team or even dignitas. The only takeaway I can find for them is that they won against Tempo Storm 2-1 in an insignificant match as they already both qualified for DH Austin.